Discreetly tucked between the intersection of East Williamsburg and Bushwick, 99 Scott, a former historic warehouse-turned-industrial chic event space named for its address, officially opened its doors to the public last week. In the lead-up to their official opening and throughout their two-year construction period, the team at 99 Scott have made an intentional effort to collaborate on joint programming with the rich 99 Scott Avenue community of surrounding artists and vendors which include the Vietnamese restaurant Bunker, mushroom farm Smallhold, fruit and vegetable purveyor Natoora, Honeys/Enlightenment Wines and FABR Studio and Workshop. “We’ve sought to inject the space with the energy of our friends as a low-risk way of learning about the space ourselves. By giving ourselves a chance to see the space in action we’ve had an invaluable opportunity to see what we can adjust or correct so that when we’re working with clients we can promise that we’ve tended to everything we could have to ensure a successful event,” says Director, Genevieve Rainsberger, who comes the venue with a decade of design and event production experience under her belt, specifically handling weddings over the the past three years at Red Hook’s Saipua which will certainly come in handy as the venue has already booked a 300-person wedding for October as one of their first events. According to Rainsberger, their most exciting collaboration to date is with their new Beverage Director, Arley Marks, Mixologist at Honey’s, Mission Chinese and Dimes, who plans to bring his passion for seasonality and flavor into the mix. Boasting 20-foot-high ceilings with windows to match, 99 Scott is a blank slate ready to be transformed. 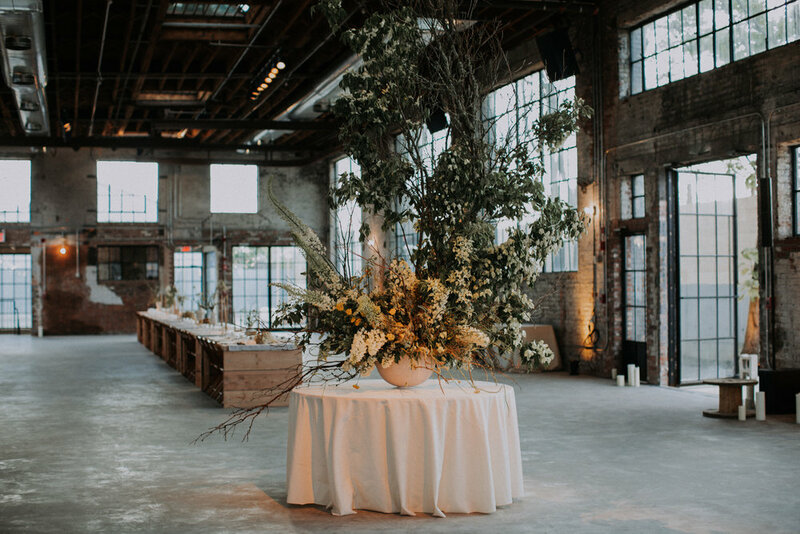 “With the rawness of an industrial warehouse and the simple elegance of natural light, the space was designed to offer a canvas to guests rather than impose itself, allowing the potential for whatever your vision might be,” shares Rainsberger. The sprawling venue has the capacity to hold 3000 guests. The Great Room alone is 5000 square feet and can accommodate up to 400 seated guests or 800 for cocktails. It is also home to an oversized courtyard that measures a jaw-dropping 8000 square feet, perfect for large-scale cocktail parties, outdoor dinners or exchanging vows. Rental fees range from $7000 - $14,000 depending on the day of the week and the month. This rate is based on a 12-hour rental of the entire space for up to 400 guests. In addition to the physical space itself, the fee covers an event director, operations manager, assistant manager and 3 security attendants as well as all trash removal, cleaning, Wi-Fi and a sound system. Hosts have up to ten preferred catering vendors to choose from along with in-house bar menu packages with a heavy focus on local distilleries. A large onsite kitchen, Green Room area and storage room are also available for use as part of the rental package. For more intimate affairs, their sister location next door, the FABR Studio and private garden, can be rented separately. By day FABR operates as an architecture studio but by night this jewel box of a space seats up to 30 for dinner or hosts 50 for cocktails. 99 Scott (99 Scott Avenue, Brooklyn, NY 11237) is a 15-minute subway ride from Manhattan with a five-minute walk from the Jefferson L Stop. For more information, visit www.99scott.com or email Genevieve Rainsberger at genevieve@99scott.com.